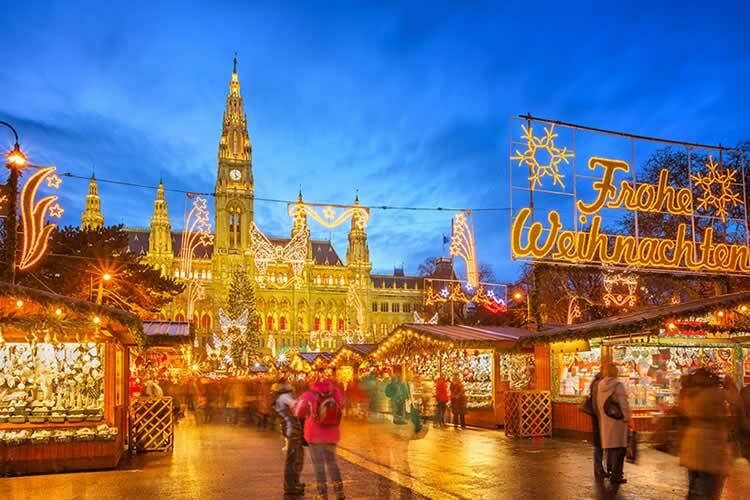 Enjoy a luxury river cruise from Amsterdam to Vienna, where you can experience the magic of the festive season. Visit Vienna’s Christmas Markets and delight in a special private festive concert at the regal City Palace. FREEDOM OF CHOICE: Cruise Amsterdam’s canals, visit Zaanse Schans or savour a baking demonstration. Tonight, enjoy a Gala Welcome Dinner. Sample local delicacies on a walking tour. SIGNATURE EXPERIENCE: Enjoy an exclusive visit to Namedy Castle. FREEDOM OF CHOICE: Dock in Rüdesheim and perhaps tour Siegfried’s Mechanical Musical Instrument Museum. Alternatively, sample wines from the region during a tasting. FREEDOM OF CHOICE: Sample local fare during a guided tour, take a German language lesson or embark on a hike through a Franconian vineyard. FREEDOM OF CHOICE: Stroll to Würzburg Residence, travel along the Romantic Road to medieval Rothenburg, or visit a family-owned farm. Explore Bamberg’s Old Town. Afterwards, cruise onto the Main-Danube Canal. FREEDOM OF CHOICE: Delve into Nuremberg’s history on a World War II sites tour, or perhaps hike through the Schwarzach Valley. FREEDOM OF CHOICE: Today, take a tour of Regensburg, partake in a Bavarian dance lesson at a beer haus, enjoy a culinary tour or hear an informative lecture on board. FREEDOM OF CHOICE: Travel to Salzburg for a city tour of several sights from Rogers and Hammerstein’s classic film, The Sound of Music. Enjoy lunch, before taking in a traditional Krampus mask show, a local Christmas custom. Afterwards, travel to Linz to re-board your ship. Alternatively, embark on a walking tour of Passau, then board your ship and cruise to Linz. FREEDOM OF CHOICE: Disembark in Melk for a tour of Melk Abbey or join a local guide for a town tour. Later, cruise to Dürnstein for free time. FREEDOM OF CHOICE: Today, enjoy a special festive guided tour of Vienna. Walk through the city centre and visit the Christmas markets at City Hall. Later, take in an enchanting Christmas recital in a local church. SIGNATURE EXPERIENCE: Tonight, visit Liechtenstein’s City Palace and attend an exclusive Cocktail Reception and a private festive concert. FREEDOM OF CHOICE: Perhaps join an excursion to Bratislava, embark on a horse and carriage or enjoy an onboard baking demonstration. Travel to Schönbrunn Palace for a guided tour and visit the Christmas market. Later, see how apple strudel is prepared.